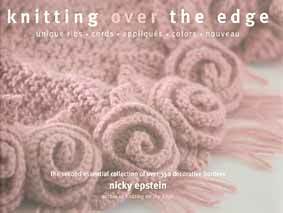 In this second collection of essential finishing techniques from Nicky Epstein, readers will find more than 350 new and unusual edge combinations in the form of unique ribs, cords, colorful motifs, flower appliqués and innovative new edgings. Get ready to be thrilled by a delightful array of loop-de-loops, circles, balls, bobbles, striped, florals and XOs. With Knitting Over The Edge, knitters of all skill levels can look forward to making their pieces truly unique! Hardcover; 5 projects, 350 decorative borders; 191 pages.